It has been really wonderful weather in Wisconsin this past week. Dream like really. Warm, perfect picnicing weather and no bugs. Couldn’t be nicer. So after a wonderful picnic with two of my sister-in-laws, 5 kids and discussing what we were making for dinner…I decided to try something different. So I took out some frozen black beans, frozen corn and anything else with a fiesta feel and tossed it in a bag. 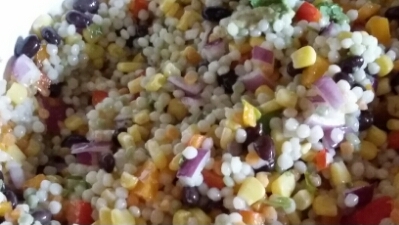 When it was time to construct the salad, I made the couscous and poured everything together in moments. Great side dish with anything grilled. The kids loved the salad, which I was pleasantly surprised about. PS This picture doesn’t do the salad justice…it was really good. Mix everything together and serve. Quick and easy. Can replace couscous with any other whole grain. Also, if preparing some ahead of time, wait until just before serving to add in the avocado.